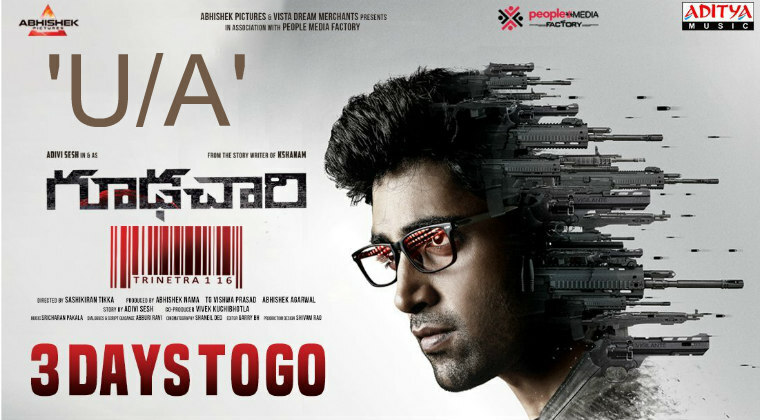 Hero Adivi Sesh’s ‘Goodachari’ has completed the censor formalities and got a ‘U/A’ certificate with zero cuts. The film is all set for a grand release on August 3rd. Starring Adivi Sesh, Sobhita Dhulipala and Prakash Raj in the lead roles, ‘Goodachari’ is an action spy thriller. Sashi Kirant Tikka has directed the movie which was shot in 168 locations for 116 days. The promotions of the film are in full swing. The teaser, trailer and songs have garnered good response and accordingly expectations are decent enough on the movie. Previous articleGorgeous Kiara Advani Birthday Celebration Stills..